Did You Get Your Free Chick-fil-A Chicken Nuggets Today? A Chick-fil-A restaurant in Santee. The 10 Chick-fil-A restaurants in San Diego County will reward customers with a free chicken entree on Tuesday if they take a short, online diabetes test. The American Diabetes Association‘s annual Alert Day on March 28 is intended to encourage people to find out their risk of deveoping Type 2 diabetes by taking a 60-second online test at www.diabetes.org/socalalert. Anyone who visits a local Chick-fil-A restaurant between 11 a.m. and 8 p.m., and shows proof they completed the diabetes risk test, will receive a free eight-piece grilled nugget entree. No personal information or test results will be collected. No purchase is required, but there is a limit of one free entree per customer. 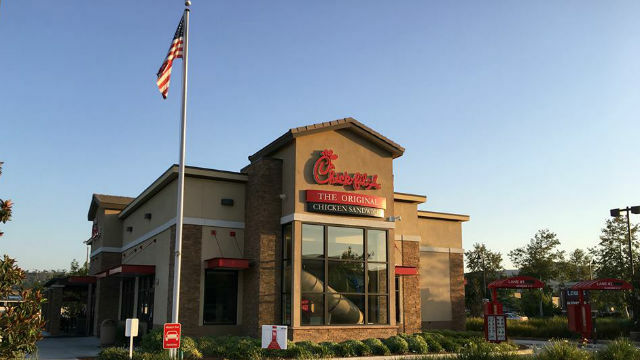 Chick-fil-A restaurants in San Diego County are located in Chula Vista, Encinitas, Oceanside, San Marcos, Santee, Escondido and in San Diego on Sports Arena Boulevard, Camino Ruiz in Mira Mesa, Carmel Mountain Road in Carmel Mountain Ranch and Camino Del Sur in the Del Sur/4S Ranch. The diabetes association estimates that 29 million Americans have diabetes, and as many as 25 percent of people with diabetes are not aware they have the disease.